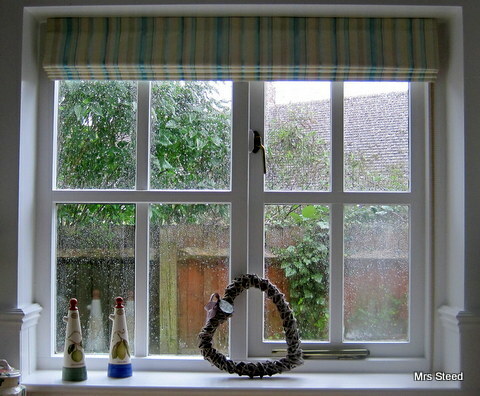 I am delighted to be able to continue to offer roman blinds on a traditional wooden batten. All our blinds are fully compliant with the new child safety regulations (BSEN16434:2014). Blinds on tradtitional fabric covered wooden battens are perfect for heritage homes or for where a slimmer profile batten is required. I aim to give as much choice as possible & continue to offer blinds on metal headrails with chain mechanism also made using products which comply fully with the standard. 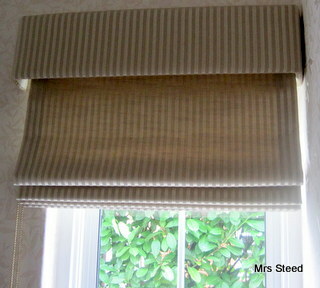 Depending on your preference your roman blinds can be made up using traditional brass or clear rings on the back. Brass or clear cord safety cleats will be fitted & regardless of your choice of wooden fabric covered batten or metal headrail your blind will of course continue to be made using traditional handsewing techniques with no unsightly machine stitching on the front. This roman blind is a cosy addition to an early 19c cottage kitchen. The interlined blind has thermal lining to improve the warmth of the room on chilly nights. Traditional fittings were used in this listed building; a fabric covered batten with brass cleat & acorn. 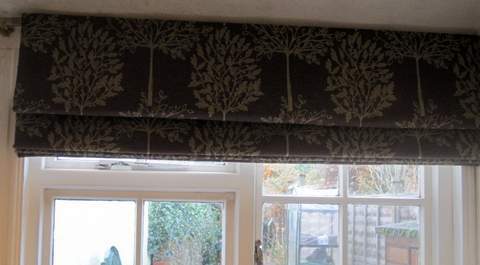 Roman blinds can be hung from a traditional batten with a cleat installed on the wall to wind the pull up strings around or from a metal headrail with a chain mechanism. A metal headrail is particularly appropriate if it is a very wide, heavy blind or you may prefer this mechanism if you are pulling up the blind frequently. In this instance the blind is fairly wide & an antique brass metal chain was chosen to complement the door hardware in the kitchen where it is to be installed. The discreet metal headrail can just be glimpsed in this side on view. 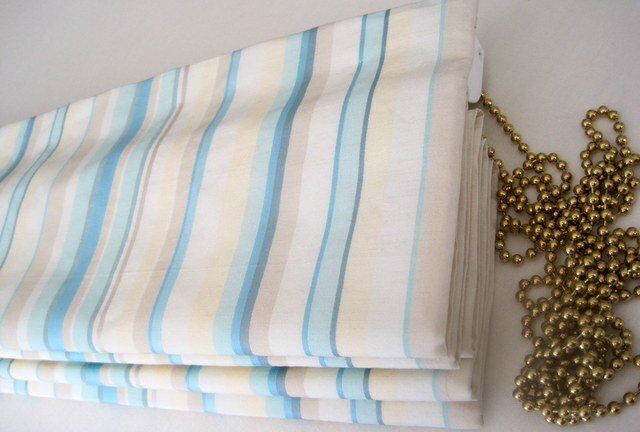 Our roman blinds are sewn by hand to avoid unsightly rows of stitching on the front of the blind. All of our blinds are supplied with a child safety mechanism. If you would like more information about this do let me know.